Packaging Design Corporation has decades of industry experience in point of sale and floor display design and manufacturing. Widen your product and brand’s visibility by drawing attention to yours among all of the others. Let the industry experts at Packing Design Corporation create the perfect floor display design for your product and brand, and maximize the floor space provided to you. For complete information on the wide range of floor display design service options at Packaging Design Corporation, call 630-323-1354 today and speak to a knowledgeable representative. You can also email anytime at info@pack-design.com and a qualified associate will respond shortly. Floor displays, or kiosks are the most common type of in-store product display found in many retail locations. Placed at the ends of aisles, these brand and product displays stand out in contrast to the rows of shelving, and can easily catch shoppers’ eyes. They come in a wide range of sizes, shapes, and styles. 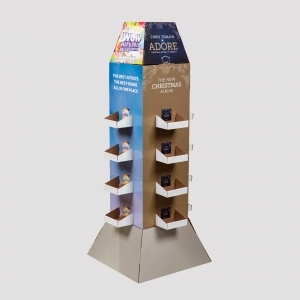 The product display experts at Packaging Design Corporation understand the value of the right floor display design. The easier you make it for the customer, the more likely a purchase will be made, improving the experience for the customer and your profitability. Grab your customers’ attention and raise awareness for your brand by using a floor display design to set apart your product. Let Packaging Design Corporation design and build the perfect floor display that will properly display your product and your brand, increasing sales and awareness. For complete information on the wide range of floor display design service options at Packaging Design Corporation, call 630-323-1354 today and speak to a knowledgeable representative. You can also email anytime at info@pack-design.com or simply fill out the contact form to the right and a qualified associate will respond shortly.